In January, Intel unveiled the new, more powerful and power saving Core i5/i7 CPUs and corresponding chipsets, this month Asus unveiled the first notebooks with built-in USB 3.0, and Nvidia’s Optimus technology enables smooth switching between chipset and discrete graphics card, also, multi-touch is standard for many new Tablet PCs while shock-resistant SSD hard drives have become an (expensive) option – but in the foreseeable future, Toshiba will not offer these features to its Tablet customers. Earlier, Toshiba had a more attractive product policy, e.g. the Portégé M400 was the first dual core Tablet PC and the Japanese are quick to bring to market new consumer and business notebooks with new Intel CPUs. But that’s history regarding the Tablet market. Only one model is available in Germany, US customers have more options including a customized M750 model. So we did a phone interview with Ulrich Jäger, Product and Business Development Manager of Toshiba EMEA give an indication of what Toshiba is planning at present – the result is simply disappointing: Toshiba has no plans to upgrade the Portégé M750 Tablet, and currently has no successor in store. Say, companies like HP need not to fear competition in the consumer market (the new TouchSmart tm2 has just arrived in US and Europe, as we have reported) nor in the business sector. 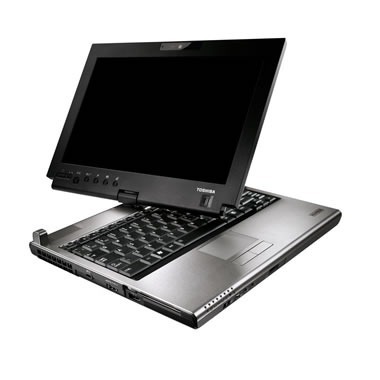 All Toshiba has to offer is the M750, a fully featured convertible model, which has the computing power and features to act as a notebook replacement. The robust two kilo device features a 12-inch dual touch-screen (input with digitizer pen or alternatively a single finger) and has all communication options (including an internal UMTS modem, default in Germany, an option in the US market). Find the list of specifications of the tablets at the end of this posting. The "hype" around the Apple iPad has resulted in a growing interest into tablets in general, but, as Jäger states, not into a "concrete demand in the business sector". Jäger adds that Toshiba has no plans to offer own slate tablet similar to those devices from Motion Computing, PaceBlade or Fujitsu. Toshiba will focus on the business segment, unlike HP with its TouchSmart series (here he specifically refers to mobile devices, not the All-in-One category). Instead, Toshiba will continue to focus on "niche within a niche" with a full-fledged laptop replacement, as the Portégé M750 is one. The display size will change. The 14-inch Tablet (Tecra M4) had been well received several years ago, with great hello from customers, but in the long run it was "not so well accepted." For consumer on the sofa at home, Toshiba offers a surfpad called JournE touch which was unveiled during last year’s IFA in Berlin. You can find some demo videos on YouTube. These surfpads will not be a box office hit given that they offer only two hours of video playback or surfing via WiFi. Also, other devices from Archos and the HP slate prototype will run Windows 7, while Toshiba’s JournE comes with the outdated Windows CE including Internet Explorer 6 . A very annoying deficiency is over now: A few years ago we saw significant price differences between U.S. and European prices, and even between Switzerland and Germany. Back then in 2006 a similarly-equipped M400 Tablet was 50% higher priced than in Switzerland, as the author in 2006 found out during testing of the device (here is the detailed report, Google translation). Current online prices are more or less the same. Since it will remain for some time we list the specifications of the M750 here. Battery "up to 5 hours duration"
Product homepage Portégé M750 DE U.S. Drivers via Toshiba DE U.S. List of Toshiba laptops with support of Windows 7 U.S.